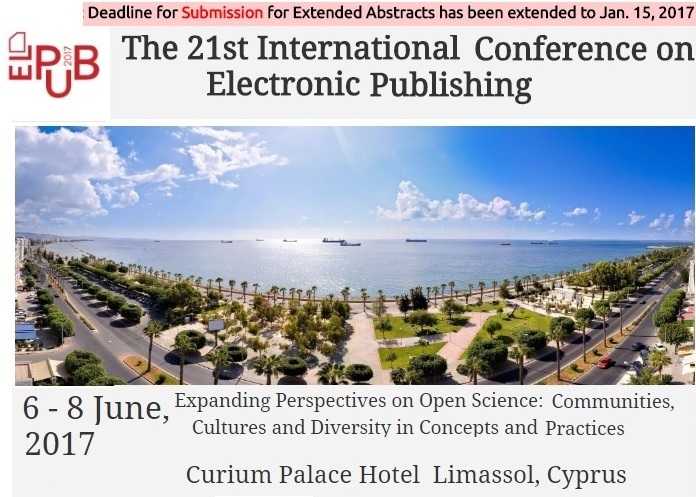 International Conference on Electronic Publishing (ELPUB) 2017: Call For Papers Theme: Expanding Perspectives on Open Science: Communities, Cultures and Diversity in Concepts and Practices. If you have a proposal for a presentation or for a session, please consider a submission. The deadline for submission to ELPUB2017 has been extended to January 15, 2017. The International Conference on Electronic Publishing (ELPUB) is entering its 3rd decade of continuous engagement with the changing landscape of publishing and scholarly communications. The upcoming conference will focus on the diverse perspectives on Open Science, one of the most widely discussed topics in research communications today. Despite the common claims that Open Science improves transparency and accountability throughout the research life cycle while democratizing the knowledge production process, empirical research and conceptual validation of these ideas has been limited. In addition, there is a growing tendency to conceptualize Open Science as a set of conditions waiting to be met, without regard for regional differences, including cultural and historical contexts of knowledge production. ELPUB, therefore, invites researchers and practitioners from diverse backgrounds to share their results and ideas at what ELPUB’s organizers hope will be a highly interactive forum. Who determines the agenda and direction of emerging discourses around Open Science? How does Open Science challenge the current positions and power of players and agents - in developing and developed countries, with scholars and their networks, commercial and academia-based publishers, research institutions and e-infrastructures, as well as their respective agendas? Are we seeing a converging global view of Open Science, or are there disciplinary, regional, and other differences that are important to consider? What are the gaps between existing Open Science policies, regulatory frameworks, and implementation requirements and how should they be addressed? How do Open Science agendas relate to the Open Innovation agendas of governments, funders and institutions? What is the impact of these agendas on research funding and dissemination practices? By assessing these interlinked questions, the aim is to improve our understanding of current challenges and opportunities in the ecosystem of Open Science, and how to move forward collaboratively in developing an inclusive system that works for a broad range of participants. Please join ELPUB in this exciting discussion! ELPUB invites submissions in the form of an extended abstract. All submissions are subjected to peer review. Authors whose abstracts have passed the first round of peer review will be invited to submit full papers. For each accepted paper, at least one author must register for the conference to present the paper. The same requirement applies for inclusion in the proceedings. Moreover, all those with accepted workshop or demonstration proposals must commit to supporting the event (speakers, lecturers, panel members, etc.) by physically attending and coordinating their activity. submitted to this conference must not have been accepted or be under review by another conference or by a journal. They will be published in an indexed open access proceedings. Furthermore, all accepted papers and posters will be archived at the ELPUB Digital Library. All contents published in the ELPUB proceedings are open access via the conference archive under the terms of the Creative Commons Attribution license, which permits unrestricted use, distribution and reproductionin any medium, provided that the original work is properly cited. All full papers, short papers and posters should be written in English, though other languages would also be considered, provided that an English translation of the abstract is also made available. Feel free to contact Leslie Chan if you have a proposal for a presentation or for a session that doesn't fit into the current framing. Please help spread the words and consider a submission!